Major General Susil Chandrapala says goodbye to Mr. Ezhilan, the district political leader of the LTTE in Vavuniya, on Monday at the LTTE's political office in Vavuniya. 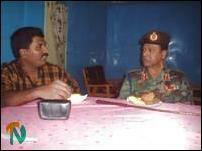 Maj. Gen. Chandrapala has been transferred to the SLA’s Jaffna division from the Vanni. The farewell was accorded to him at the office of the Deputy Inspector of Police for the Vanni region. Superintendent of Police, Mr. Ranjit Kasturiarachi, presided over the event. The DIG, Mr.M.B.Beddewela, senior SSP Mr. Miskin, Vavuniya headquarters Inspector, Mr. Wijenayake, Col. Senanayake, other senior Police and SLA officials, and Buddhist monks participated at the farewell. Following his farewell by the senior Police officials, Gen. Chandrapala visited the LTTE’s political secretariat in Vavuniya and met with the organization’s political head, Mr. S. Ezhilan, who bade farewell to the SLA commander. As Gen. Chandrapala thanked the LTTE for its cooperation with the SLA despite their wide differences on many issues, Mr. Ezhilan said that despite a huge gap in their views, the LTTE was ready to extend its cooperation to anyone to solve the people’s problems in Vavuniya. According to sources, he said that he was able to have a good working relationship with Gen. Chandrapala, and gave a farewell memento embossed with the Tiger symbol. 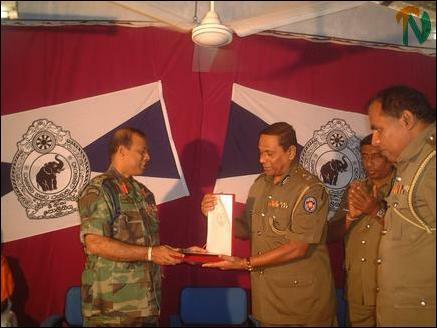 Vavuniya DIG Mr.M.B.Beddewela is seen handing over a memento to Maj. Gen. Chandrapala (L) on behalf of the Police. Mr.Miskin the Senior Superintendent of Police Vavuniya is also seen in the picture.